Central London may be a mishmash of roads, parks, train lines and tower blocks, but look a little further out of the city and behold; thick woodland that is buzzing with the sound of paint splattering! Delta Force Paintball has been operating across the UK for 24 years and not a minute has gone by when we haven’t had enthusiasts looking for awesome paintball action in mind. We invest heavily into our base camps and game zones, upgrading structures and customising zone designs to follow popular trends. As for equipment, we aim to keep up with the latest in paintball technology so that visitors can feel safe in the knowledge that our protective gear and weaponry are the most effective and reliable in the business. 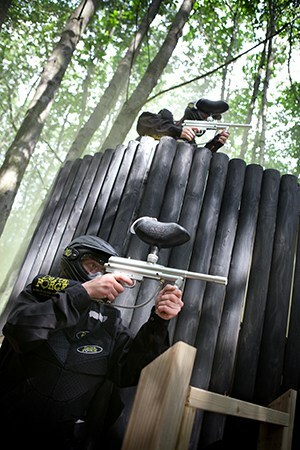 From central London the paintball world is your oyster. There are 12 London paintball centres scattered around the fringes of the city, all reachable within a 40-45 minute drive, all meeting Delta Force Paintball’s exceptionally high standards. Whether you are a fan of fast-paced speedball, a covert woodsball sniper or an all-round paintball specialist, our game modes are designed to be exciting as much as they are challenging. In some zones, it may be all about finding the right angles to catch your enemy unawares, while in others it will be about utilising the natural surroundings for the best cover. Getting your team tactics right could be the difference between success and failure, e.g. tasking your speediest player with the job of making a b-line for the mission objective while your best marksmen (or women) provide sniper cover. Don’t spend your weekend lazing about the house; grab some mates and willing/unwilling family members and head over to your nearest Delta force Paintball centre today!